QD or “quickly detachable” bushings are split tapered flanged bushings with the split running through the flange and taper. 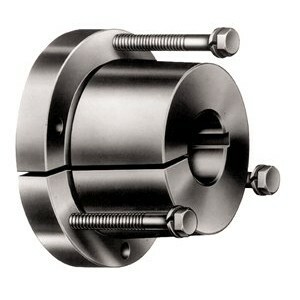 These QD bushings provide excellent clamping force on the shaft. QD bushings are utilized on sprockets, sheaves and pulleys to increase clamping force over standard bored to size product that only utilizes a keyway and set screw to lock onto the shaft. QD bushings are very popular and are interchangeable between manufacturers.